The artists’ presentations are open-ended; the speaker can do a demonstration of their art or craft, present examples of their work, or create a unique format specific to their topic. 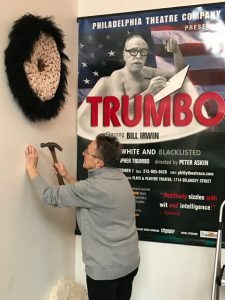 Arlene Olshan, MAAG’s co-founder and executive director presented the first Artist Talk in February. Arleen talked about her fulfilling lifetime as an artist, teacher and therapist. Her colorful story of learning leatherwork and becoming a master leatherworker charmed her audience and lead to numerous thoughtful questions. Arleen is a good storyteller and made a great introductory speaker for this new series. 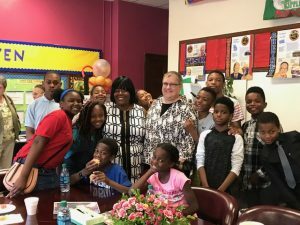 MAAG is Arleen’s dream come true and we are truly grateful for her dedication. 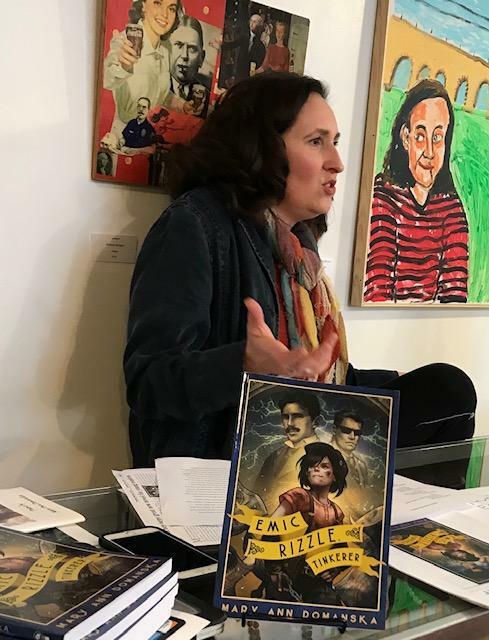 In Emic Rizzle Tinkerer, Mary Ann Domanska took her daughter’s imaginative childhood experiences and built a wonderful novel for elementary age readers. There are elements of mystery and intrigue, as Emic boldly and fearlessly tackles the challenges of per-adolescence. This is her first published novel. The next novel, a work in progress, The Grit of Cora Belle Delany emerges from Mary Ann’s childhood in which she lived with parents who fostered dozens of children in their home. 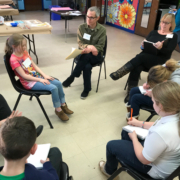 Mary Ann presented to a highly engaged audience on March 2, with her vivid descriptions of the inner life of a teenage girl in the foster system. In Cora Bell’s life there was no end to what she could fear and worry about. Sharing this fictionalized child’s life Mary Ann reveals how resilient a child can be, day after day , when life is unfriendly and she doesn’t know what tomorrow will bring. She read from a working draft of this emerging novel. This excerpt of this poignant, eloquent description of a child in “emergency temporary placement” left one wanting to hear more, to know what would become of the vulnerable, yet intensely strong young character. When asked, what was the writing experience like for her, Mary Ann said, “ Sometimes I am in control and sometimes the character is in control.” Her immersion in writing about character and place produces imagery that is compelling and irresistible. It was a pleasure and an honor to hear Mary Ann read her work in progress. We look forward to the completion and publication of this moving, insightful tale of survival. Please join us for future Artist Talks on the first Saturday of the month, at MAAG, 4-6pm. Light refreshments are provided and donations are welcome. You’ll learn basic drawing & painting skills; applying them to painting outside murals in Mt. Airy. All children ages 10 -14 welcome. Free of charge and all art supplies will be furnished. Classes Start January 15th and run til May 2019 every Tuesday & Thursday 3:30 – 5:30 PM. This project is jointly sponsored by the Mt. Airy Playground, the Mt. Airy Art Garage, and the generous sponsorship of the Drumcliff Foundation. 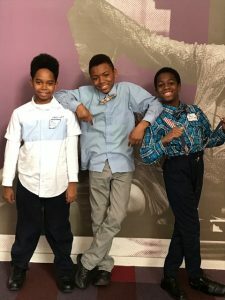 America’s Got Talent Semi Finalist, at the age of 11? Opera Prodigy? Arielle Baril is all that, except today she is a whopping 14 years old! Arielle and her brother, Joshua Dufour (who taught her to sing), will be special guests at Emlen’s “Back To School Night” Tuesday, Sept. 26. They’ll be telling their stories and singing for the entire school! 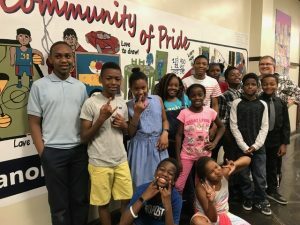 And what better launch for this next phase of the Community of Pride (COP) Mural and Literacy Project than to continue empowering children with community awareness and commitment while teaching art techniques, literacy, skill building, art history, and confidence. Arielle and Joshua will perform and speak about their experience as performing artists. They will also speak to pride…in your family, yourself, your culture, and your community. Want to know more? Check out Arielle on YouTube. We, at the Mt. 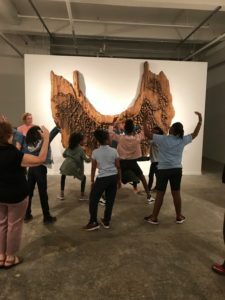 Airy Art Garage, see our partnership with Emlen, with Arielle and Joshua and their family, and a host of others, as yet another way to dream—to share and empower our children and the entire community to be inspired and motivated. This event is free and open to the public. You won’t want to miss this. Get to know our Guests! Arielle Baril is a 14 yr. old classical opera singer who was recently seen on Season 10 of America’s Got Talent. Arielle is a Golden Buzzer Act who made it straight to Radio City Music Hall Live Shows. As the youngest performer that evening, Arielle was given the honor of closing a live telecast at Radio City for AGT where she was a semifinalist. Arielle has served as Master of Ceremony, sang at Madison Square Garden twice, competed as finalist in top Classical competitions, and several other events by invitation. She is represented by Headline Talent for television and film primarily, but her passion is classical/art music. Arielle Baril and her team plan on releasing a classical EP and especially a single which will lay the foundation for future live shows. Arielle will be in the 9th grade at Abington Jr. High School. Arielle is considered a child prodigy with a voice beyond her years. She was trained by her then 20-year old brother Joshua who recently graduated Ithaca College and will attending Columbia this fall. He continues to mentor her vocally. Arielle now studies vocal performance with Dr. Barbara DiToro of Temple University. Arielle is currently working on a classical crossover EP with her brothers Christophe and Joshua who are talented musicians themselves. Arielle strives to empower underrepresented children everywhere with the idea that all genres of music are available to them. 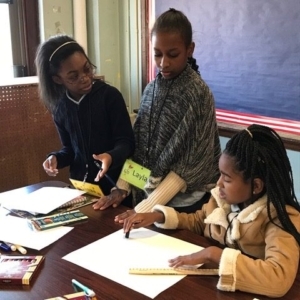 As an underrepresented image in the classical world and as young person who chose this genre over others, Arielle is looking to establish herself as an artist whose mission is to convey a message to her peers to dream beyond the glass ceiling. Joshua Dufour was born on February 23, 1995, in Drexel Hill, PA. He is the son of two Haitian immigrants. From a young age, Joshua’s passion has always been in the arts. 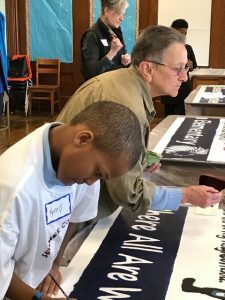 At the age of 8, he joined the Archdiocesan Boy Choir of Philadelphia and sang with them for five years. He was a member of his high school’s concert and chamber choirs, the concert band and wind ensemble, the marching band and the drumline, as well as his high school’s musical theatre productions, presented at their very own Upper Darby Performing Arts Center. For his work in theatre, Joshua was nominated for the Cappie Award for Best Male Vocalist in the Greater Philadelphia area, as well as Best Male Critic. It was during his final years of high school that his younger sister Arielle was old enough to start mimicking his singing around the house and imitating his operatic sounds. Joshua quickly realized that Arielle had a natural gift for the vocal arts and proceeded to train her in operatic soprano songs. 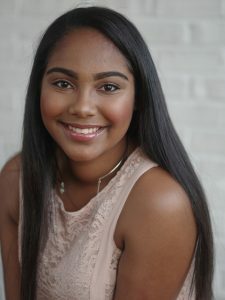 Arielle’s unprecedented vocal ability soon led her to the America’s Got Talent stage where she received Heidi Klum’s Golden Buzzer and finished as a Semi-Finalist. Joshua received his Bachelors of Science degree in Cinema & Photography, with a Concentration in Cinema Production and a Minor in Music, from Ithaca College in 2017. He has worked on various student films as a director, writer, producer, editor, and production designer. During his undergraduate education, he was a member of the Martin Luther King Scholars Program, a dynamic learning community dedicated to developing future leaders and global citizens through Dr. King’s legacy of social justice and equality. He received the Ithaca College Inspiration Award for his work in the community and on campus. This fall, Joshua is attending Columbia University’s School of the Arts to receive his Masters of Arts degree in Film Studies. 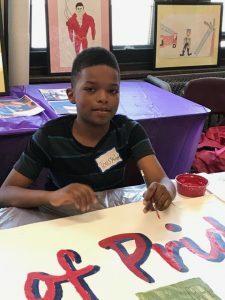 As a first-generation Haitian-American, Joshua believes a sense of self and culture is extremely important and he makes an effort to keep his Haitian roots intact. 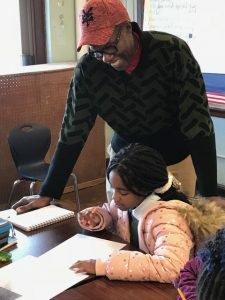 He is a firm believer that diversity is crucial to human development and that people must share their experiences in order to gain awareness of others. He dreams of becoming a director, producer, actor, and singer. 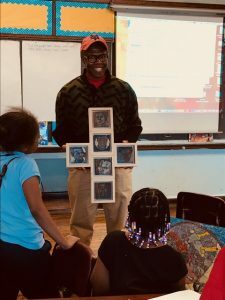 His hope is to use his artistic voice to shine light on the social injustices of the world, spread awareness of race, culture, and ethnicity through artistic mediums, and give back to his brothers and sisters in Haiti. I had a difficult experience last night. For the first time in a year, Linda and I walked together on Mt. Airy Avenue past our former building for the Mt. Airy Art Garage. We witnessed the lights being on, our logo being removed from the glass front and people working in the space. As I looked at the walls that were the gallery, the pod that our architect designed for the bathrooms, the studio walls that were 1/2 rippled plastic, seeing the light and openness of the space with the fans turning, I realized how my heart was broken when this lovely creation was taken from us. The move probably affected all the artists, art-loving neighbors, and supporters who helped us build out the location too. The six years we celebrated the arts in that space was beyond all of our dreams and expectations. We have moved forward and are rebuilding, but neither of us expected the emotion that poured out when seeing the property once again. So, where are we now? How have we been doing during this period of transition? The Mt. 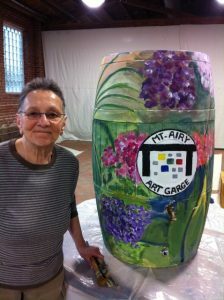 Airy Art Garage is currently operating a fine art and handcraft gallery at 6622 Germantown Avenue, in partnership with Mt. Airy USA. We are waiting for the promised buildout of our new space (across the street) at 6651– 59 Germantown Ave. with the current proposal for completion being Fall 2018. This new location will be transformed into a multi-use space for MAAG with new apartments above our digs. 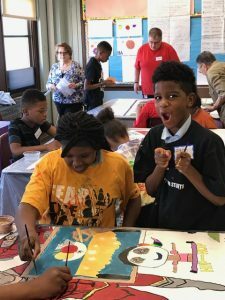 We have been very active this year in local public schools, working with children on murals, partnering in a variety of artistic endeavors and businesses in our area. 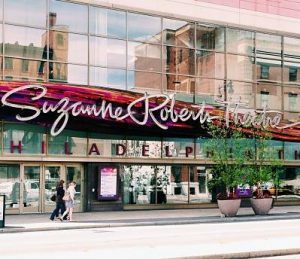 We have partnered with Philadelphia Theater Company and will deepen that partnership in 2018. We continue to work with artists of all disciplines, spreading creativity into Pleasant Playground, showing work in City Hall, and, of course, highlighting the work of Northwest artists, from emerging to professional. Next week, Saturday, August 26th, we will be hosting our first fundraiser at Summit Presbyterian Church with Never Gonna Give You Up (particularly appropriate today) 80s Dance Party with DJ Robert Drake. We have reduced the ticket price to $20 to make it more affordable for everyone. It will be a great night of dancing, making new friends, and enjoying donations from local businesses like Earth, Bread, and Brewery, McMennamins, Night Kitchen, High Point, and more. 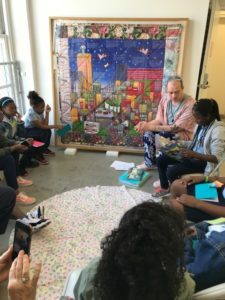 Remember, in supporting MAAG, you are supporting community artists — your friends, neighbors and family members. Visit us at the Gift Shop. We are open Wednesday–Saturday, from 12–6 PM. All are welcome. Artists, continue to bring your work. We will make space to show and market your creations. And tell your friends. 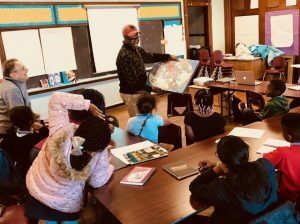 There is a story to be told, and it’s unfolding at Eleanor C. Emlen School, a public school with lack of access to the arts. A public school where the children are guaranteed one meal a day, where many kids walk to school. 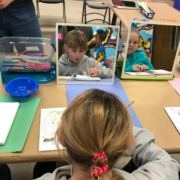 But dreams are happening and possibilities are being introduced as the children immerse themselves in the creativity of the visual arts, (performing arts an unexpected bonus), while we add on the critical literacy component in Phase 2. Hope and opportunity, along with pride and tears of joy and celebration, are opening new doors — led by artists from the Mt. 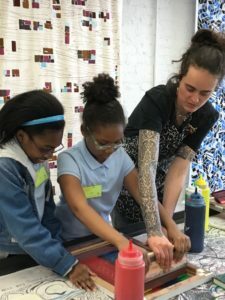 Airy Art Garage (MAAG), teachers from Emlen, an inspired principal, Ms. Tammy Thomas, and, of course, the most amazing class of 4th and 5th grade kids ever. 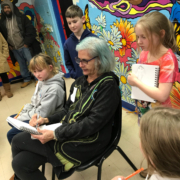 · Denise Veronick, Emlen lead teacher, during the mural dedication: “We didn’t pick the best students (to be in the COP Project). We didn’t pick those with the highest grades or best attendance. We chose the ones we felt needed it the most, would be impacted the most, would affect their lives the most. I learned many important lessons. First, everyone is an artist in their own way. Everyone loves when another appreciates their work. These kids were brave and, in the end, reaped the benefits of putting themselves out there. 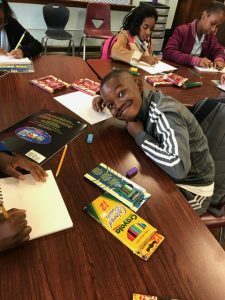 · Touissant: “Toussaint came to Emlen as a 4th grader in the Autistic Support class. He was quiet and seemed to defer to the slightly older and slightly bolder children. In fact, I rarely heard him speak. I chose Toussaint to participate in this project as a 5th grader because of his artistic ability. When he put his mind to a project he saw it through to the end. He put all he had into his drawings, using every bit of space on the paper and using color like a pro. As the project got started we watched Toussaint bloom into a whole new person. His confidence grew before our eyes. He made friends with a few students finding shared interests such as football and Pokemon. He was actually having full conversations, but that was only one example of his confidence. One class period we were going over a Powerpoint that consisted of words and pictures. When asked for a volunteer to read Toussaint’s hand shot up. (I knew he could not read all the words but he wanted to try.) He stood proudly and read the words out loud as I whispered them to him. He was able to put himself out there because he trusted the group to not make fun of him. He took a giant step in his social confidence that day. Plus he ended up selling his original framed piece.” — Denise Veronick, teacher. · Ishaaq: “Ishaaq came to Emlen for 5th grade. He was a student with limited academic ability and many behavior problems. The first few months of school his teacher complained that he did no school work — all he did was draw all day. We later found out that he couldn’t do the work so he did what he did best, draw. Whenever Ishaaq came to work on the mural he had perfect behavior and worked harder than anyone else. He had found his niche at Emlen School. His two drawings were a prominent part of the mural. Had he not been a part of this group I fear the growth we saw in June would not have happened. He carried himself with pride, his behavior was completely turned around and his school work was getting done. I saw him the morning of his 5th Grade Move Up Ceremony, he was bursting with pride and looking forward to getting awards in front of his classmates. 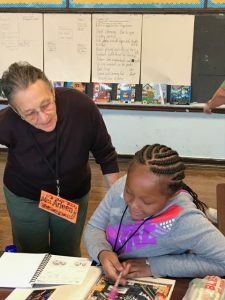 (I gave him an Art Award and his teacher gave him a Most Improved Award)” — Denise Veronick, teacher. 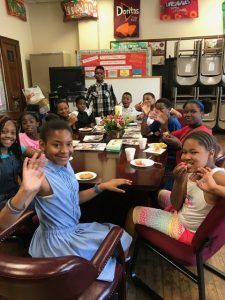 Celebratory breakfast honoring the participants at Emlen for Mural Dedication Day. · Naomi: Naomi showed she had a flair for showing what pride meant to her. She drew a picture of her uncle who is a firefighter along with his fire truck. She spoke about how proud she and her family are of her uncle. 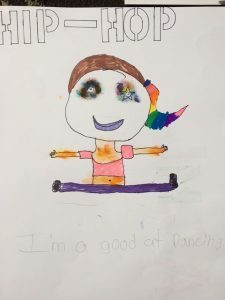 She also drew an excellent picture of a hip-hop dancer. This drawing captured the attention from an adult who wanted to own this drawing. They negotiated a price, discussed time spent and value, Naomi signed her work, and both walked away happy. 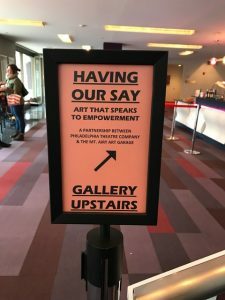 MAAGs exhibition of “Having Our Say” at PTC! Kids are loving every minute. 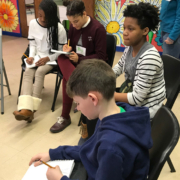 · Free tickets and a bus to see “Having Our Say” at the Philadelphia Theater Company (PTC) was a highlight. Thank you PTC for your partnership with MAAG! Most of the students had never been to see a live play. They were all dressed up and on their best behavior. They made us all proud! And at the end of the performance they all got to see MAAGs art exhibition in the gallery. Even better, one child texted her Mom during the entire show — it was her first time ever going to a live performance in a theatre. And Mom said, for her daughter’s birthday, they were next going to see “Wicked,” and we were sworn to secrecy! For most of these kids, it was their first time for live theatre. And they turned it out! Proud of YOU! 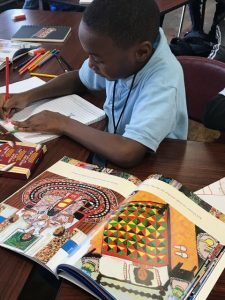 · Art At City Hall student showcase: A special invitation from the Philadelphia Office of Arts and Culture to showcase the work of the children from the COP Mural Project where art is making a difference in the community. Exhibition runs from August 7 – Sept. 29 with the reception on Wed., Sept. 27 in Rm 116. Hip Hop Girl — SOLD! 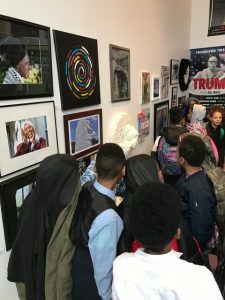 · Young artists selling their work: We never saw it coming. Framed original artwork, ready to go to City Hall, were all over the COP artroom. Two students sold their work. So, next year, part of the program will involve framing all artwork, creating their own artists bio’s, with sale prices attached. In short, curating and selling their work! So, you may ask, what’s next? We can barely contain ourselves we are just that excited. 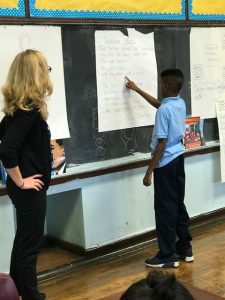 As children chase the teachers and principal at Emlen to be in Phase 2 starting this September, we proudly announce we are adding a literacy component. You will be hearing more about the Community of Pride Mural and Literacy Project. Just know this. Maybe, just maybe, you may be able to attend Emlen’s “Welcome Back to School” night on Tuesday, Sept. 26 at 5:15 pm. 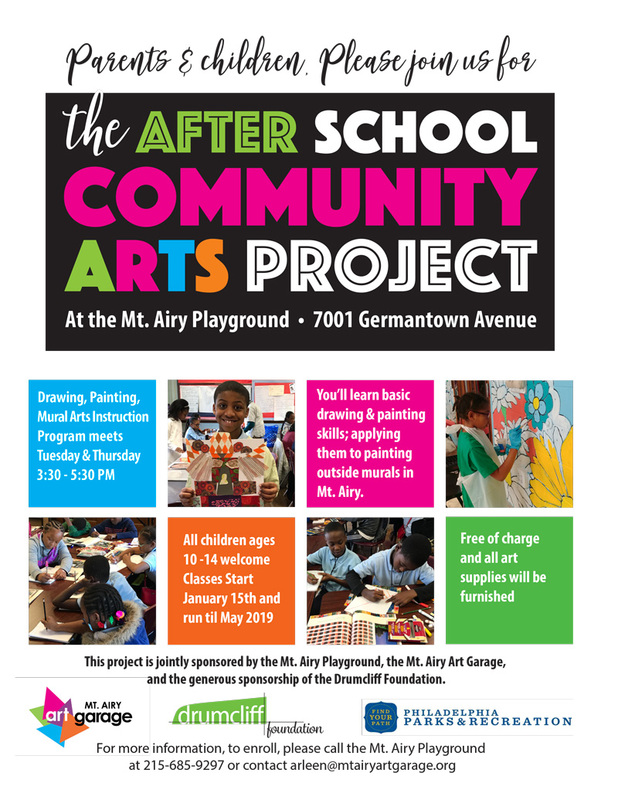 Mt Airy Art Garage will be launching Phase 2 and featuring Arielle Baril (now 14 years old) who will be telling her story and singing for the entire school. Don’t know who she is? Well, check this out, and believe that you WILL want to be at Emlen on that night. Stay tuned. There’s so much more going on. You won’t want to miss a thing. Community and creativity are truly an antidote to these challenging times. We, at the Mt. Airy Art Garage (MAAG), have had our own unique challenges. We’ve done some grieving, some assessing, some growing. We’ve started a strategic plan (thank you Dragonfly Partners!). 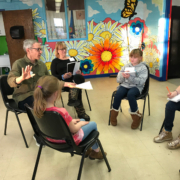 We’ve also been quietly busy — new partnerships such as those with Philadelphia Theatre Company for “Having Our Say.” (Stay tuned as that partnership deepens.) We especially want you to know we are alive and well, we are moving forward, you’ll be hearing a lot more from us, and we want to hear from you. 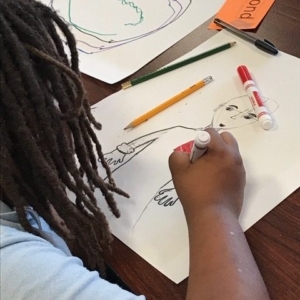 Our Community of Pride Mural Project is forging ahead as children at both Houston and Emlen Schools are now working on their murals which explore the question “What Makes You Proud?” As this project continues, the next phase will add a literacy component! Plus, our new flagship location and display space at 6622 Germantown Ave. (right next to Little Jimmie’s Bake Shop), is a joy to behold! 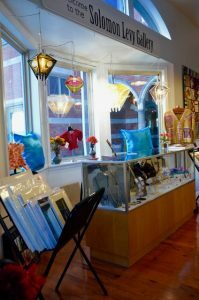 Filled with unique handcrafts and fine art, all work is original and created by local artists. Some 30 artists, in a myriad of mediums, are showing and offering their goods for sale. Do come and visit. 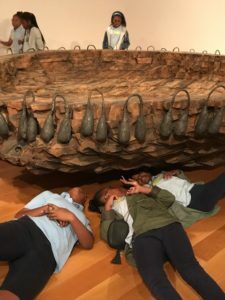 · The City of Philadelphia and the Philadelphia Cultural Fund — your support for the last two years has allowed us the breathing room we so badly needed. We are grateful. · Mt. Airy USA (MAUSA)— we’re so proud to have you as a partner. When we did not know what our next steps would be this past August, MAUSA stepped up. You have provided us with meeting and event space at the Hub; you provided our flagship location where we now reside; and a future home. We urge all our supporters to “show your love” by attending their upcoming fundraiser on Sat., April 1. As MAAG supporters you’ll even get a 50% discount. Just hit the link directly below and make sure you use the promo code MAAG! We at MAAG intend to keep the momentum going. We want you to know we are back and moving forward with our eyes planted firmly on the future. So come on by. Ask questions. Share your ideas. Stay tuned for community meetings we host. Grow your creative soul with us. We are back.